Jacky Faber, soldier, sailor, spy, and sometime pirate, condemned for life to the English prison colony in Australia for high crimes against the Crown, has once again wriggled out of the grasp of British authorities. Back on her flagship, the Lorelei Lee, she happily heads back to England in the company of dear friends and her beloved Jaimy Fletcher. However, due to a typhoon, an earthquake, tidal waves, pirates, and her own impetuous nature, Jacky is cast into a world of danger that extends from the South China Sea to the equally treacherous waters of politics in London's smoky dens of intrigue, deception, and betrayal. Jackie is back! I absolutely LOATHE the wait in-between Jacky books. Usually it isn't SO bad. For the last 7 books or so they have come out steadily in the middle of August...however this year for what ever reasons, it was released 3 months late! The pain! The horrible horrible pain of having to wait to find out what happens to my dear darling Jacky after the typhoon hits! Rest assured though, this book was worth the wait. Even though I love this series quite a bit, the last two haven't been my favorites. For a while there I thought that Jacky, Jaimy, and the gang had run out of tricks. The last two books have been quite a bit of repetition as Jacky performs tricks that are tried and true..but running out of dramatic effect. This book is quite the opposite. Jacky is still a cunning and mischievous mistress of disguise, but this time she has better costumes, better plots, and definitely more drastic ways of worming herself out of tight and uncomfortable situations. 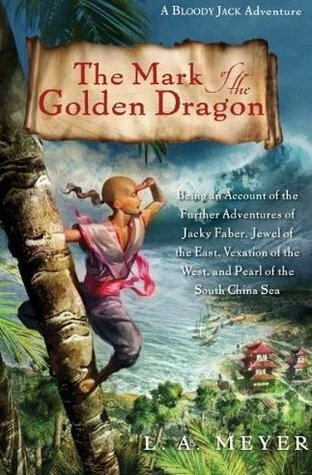 The book starts right where the last left off, and begins with Jacky's adventures in the East Indies. After being separated by all of her crew except 8 year old slave boy Ravi, Jacky is in a bit of trouble. The first part of the book is mostly the talk of her adventures along the islands of Malaysia and the coasts of India. This chunk of the book actually reminded me of the Oddessy. Jackie showed up on a random island, saw what there was to see, then left her mark on the people there...whether that mark was good or bad, depended on if the people themselves were good or bad. Though each of these adventures is cool, clever, and fun, I miss when Jackie would actually get to know all the people she met along her travels. Of course she can't get to know everyone, but some of these stops were potential to meet really interesting characters and they fell flat in that category. I know...I'm being picky...but one of the best things about this series was how amazingly well Meyer used to blend character, plot, and setting into something so real that you could practically experience it with all of your senses. I miss that. Eventually, Jackie and Ravi find their way to the rest of the gang on-board the Nancy B. Alsop, and proceed to England where they run into the darling and dashing Richard Allen and Joseph Jared. Normally, I love Jacky's flirtations with other dashing gentleman. Joseph Jared in particular. I didn't get nearly as much Jared as I wanted in this book, but we got plenty of Lord Richard Allen. Richard is dashing lord, a captain in the Royal Army, gorgeous, and a bit of a ladies man. Jacky and Richard have quite delightful banter that makes you giggle like a schoolgirl and want to like...I dunno...slap him with a glove or something. He was definitely needed in the story, because I have no idea how Jacky would have managed to run in the same circles as royalty without him. I even love how he calls Jacky Princess Pretty Bottom...usually just Princess. So even though I do love him...I just want Jacky and Jaimy to get their happily ever after you know? So many of Jackie's other potential paramours find their lady-loves (usually among some crazy girl that is friends with Jacky herself) and I just want Richard to find his Lady Allen and live forever in wedded pain bliss. With Richard Allen married off, that only leaves Robin Raeburn, Joseph Jared, and Arthur McBride for her to see successfully introduced to one of her saucy friends. Wow...Jacky certainly does have quite a following of men...especially since she's already married off what...like 4 of them? I give The Mark of the Golden Dragon 5 Keys. I am really glad that it is becoming more like the series that I fell in love with in the beginning. Apparently Jacky's next adventure will take her to Portugal with Lord Richard Allen, and I have another whole year to wait for that one...I will have to keep myself content with re-reading this series when I'm in need of a fun and fantastic adventure full of cross-dressing, sword-fighting, bed rumpling, awesomesauce. I'm not sure if I want it to ever end, but if Jacky starts running out of new ideas, I'd rather her retire with a bang than get dragged out to the point of me falling out of love with her and the gang. I read the first four and fell in love with them but struggled to get hold of any more. They've been on my wishlist for a least a couple of years. I didn't even know a new one had come out so thanks for sharing. I am going to have to splash out and order them online!